§501. Flag of the State. (a) The length of the flag shall be seventy inches. (b) The width of the flag shall be thirty-seven inches. (c) The star shall be three and one-half inches in diameter. (d) The circle around the star shall be six inches in diameter. (e) The circle around the canoe shall be twenty-six and one- half inches in diameter with a width of one inch. (f) The proportions of the figures shall be as in the flag attached to and incorporated in this subchapter. Source: YSL 1-51 §1, modified. §502. Display of the flag. (a) The flag of the State of Yap shall be displayed in the open only from sunrise until sunset and during such hours shall be displayed only on buildings, flagstaffs, or halyards. (b) The flag of the State of Yap shall be hoisted briskly and lowered ceremoniously. (c) When the flag of the State of Yap is flown or displayed together with the flag of the Federated States of Micronesia on separate masts or staffs, it shall be flown or displayed at the same level. (d) When the flag of the State of Yap is flown or displayed together with the flag of the Federated States of Micronesia on a single staff or halyard, the flag of the State of Yap shall be flown or displayed below the flag of the Federated States of Micronesia. (e) The Governor may establish rules and procedures for the half-mast display of the flag of the State of Yap upon the death of a government or traditional leader or distinguished citizen of the State or Federated States of Micronesia, and may establish other rules and procedures for the display of the flag consistent with the provisions of this subchapter. Source: YSL 1-51 §2, modified. §503. Desecration of the flag; penalties. (a) A person who knowingly casts contempt upon any flag of the State of Yap by publicly mutilating, defacing, defiling, burning, or trampling upon it shall be fined not more than $100.00 or imprisoned for not more than six months, or both. (b) The term "flag of the State of Yap" as used in this section shall include the official flag as described in section 501 of this subchapter or any reproduction thereof for official or unofficial purposes and having the same or different dimensions. Source: YSL 1-51 §3, modified. Cross-reference: Section 501 of this subchapter is on the flag of the State and contains a detailed description of the official State flag. This image was found at http://fsm.embassy.gov.au/files/phpi/AAPS%20picture1.jpg at http://fsm.embassy.gov.au/. The picture caption reads: "Accredited to the Federated States of Micronesia, the Republic of Palau, the Republic of the Marshall Islands, and the Commonwealth of the Northern Marianas..."
So, from teh submitted picture, the flags are (from left to right): Republic of Marshall Islands, Yap (Micronesia), Federated States of Micronesia. 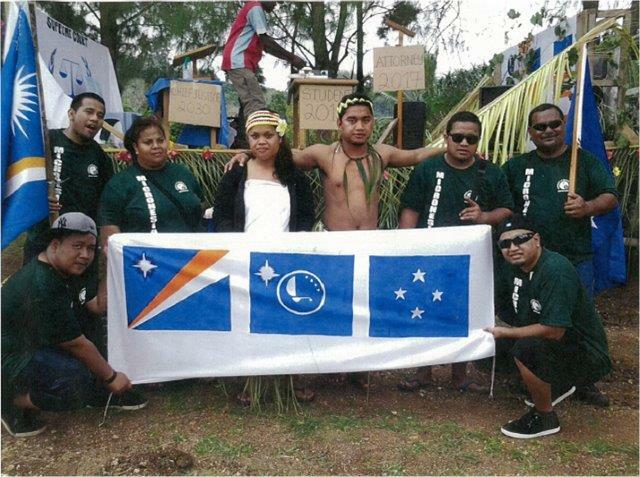 Since everybody in the picture you send has a t-shirt that says "Micronesia", I am certain that it is the flag of Yap State (a variant, indeed), since it features four stars inside the circle (which I think are the four States of the country), plus the bigger four-ray star on the hoist. The flag combines the flag of the participating countries. The sun as a symbol of the Marshall Islands, the boat represents Yap and the four stars refer to the Federated States of Micronesia.